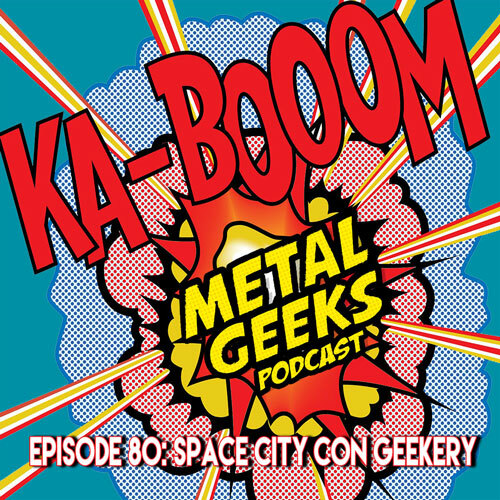 Metal Geeks 80: Space City Con Geekery | MSRcast and Metal Geeks Unite! Join us on an adventure into Space City Con which happened in Houston Texas July 24 – 26, as your host, Cary the Metal Geek, and the voice from the other room, aka Riverdragon169 aka the wife check out the show, do some interviews, and host an impromptu Podcast recording with friends! Interviews from the show include Overground Comics head honcho, Jon Hughes, as well as Star Wars novelist James Kahn who wrote the original adaptation of Return Of The Jedi, and zombie author Jonathan Maberry. Rounding out the episode is a roundtable podcast recording from the Zone Sci Fan film room including Jo’nathan from the Zone, Craig Price from Reality Check Podcast, Jon Miller from Dogfin Radio, Cassandra and Sarah from Sarah and Cassi’s Nerdy Adventure, Robb Zipp from the Broken Frames show, and Zach and Jonny from Warpod podcast. Most of these guests are part of the Houston Nerd-Casting Collective! Check out our brand new sponsor Tweaked Audio at www.tweakedaudio.com and use the special discount code “metalgeeks” to save 33% off your next order. Tweaked Audio are purveyors of high quality headphones that come with a lifetime guaranty! Yes, Lifetime Guaranty! Order today and let them know you are part of the Metal Geeks Society! Join us on our website at www.metalgeeks.net to keep up with all the geekery. Follow us on twitter, @metalgeeks, and @msrcast. You can now find us on Instagram, @metalgeeks. Find us on Facebook/MetalGeeks. Subscribe to Metal Geeks Podcast on iTunes, and leave a review and a like us whilst you are there. You can also find us on Stitcher! Don’t forget to pay a visit to all of our affiliates including Houston Nerd-Casting Collective, Ultness.com, Lightening Radio, Nerdbong.com and ESOpodcast.com, your home for all of our Metal Geeks Shenanigans! Catch you on the next episode, and Keep It Geeky!